“I have to admit that I’ve never before seen Mr. Macaluso’s other books, portraying various Holmes stories with Lego-based illustrations, but I’ve always found the concept amazing and admirable. Now I’ve obtained a copy of his latest work, a modest little book recreating scenes from The Canon, one for each letter of the alphabet. I suspect that each of the illustrating photos first appeared in one of his previous Lego books, but I don’t know for sure. I do know that this is a fascinating little volume, and each simple photo, lovingly recreating a scene from one of the original stories, is great fun. Each time I looked at one of them, I was prompted to recall the events of the story, and to admire how cleverly the author made use of the Legos. I recall playing with Legos as a small child in the late 1960’s and early 1970’s. (My sister and I inexplicably called them “toddle”, a word that’s still on the tip of my tongue today when I encounter a piece of Lego.) Once when I was very small, crying with frustration as a Lego wall that I was attempting to build kept pulling apart and falling, my dad – fresh home from work – showed me how bricks should overlap to provide strength. In those days, all we had were the bricks, and maybe a few windows. Later, in the 1990’s, my son had fancier Lego sets, but nothing like what would eventually be available. Seeing the illustrations in this book, I have to wonder if one can buy Holmes Lego figures, and top hats, and lamp posts, and Napoleon hats, and Hell Hounds, and all the other items that make these so amazing. If so, I want them. If not, and if Mr. Macaluso made them, I’m extremely impressed. A Sherlock Holmes Alphabet is available for pre order from all good bookstores including The Strand Magazine, Amazon USA, Barnes and Noble USA, Amazon UK, Waterstones UK and for free shipping worldwide Book Depository. The Sherlock Holmes Alphabet brings iconic scenes from the Sherlock Holmes canon to life using Lego figures in high resolution images. In addition to pre-publication copies of A Sherlock Holmes Alphabet, we are also offering copies of the Sherlock Holmes Re-Imagined books and also copies of the complete collection. Five years ago, James Macaluso began building scenes from Sherlock Holmes stories in LEGO® figures. This became a series of books covering twelve of the adventures of Sherlock Holmes titled “The Adventures of Sherlock Holmes Re-Imagined”. Each book featured many high resolution features as well as Sir Arthur Conan Doyle’s original text for the stories. They went down a storm with both fans and critics. James was asked to create more Sherlock Holmes scenes in LEGO® and the idea for the Sherlock Holmes Alphabet was born. Thus begins A SHERLOCK HOLMES ALPHABET, in which selected characters and objects featuring in the Sherlock Holmes stories written by Arthur Conan Doyle are presented in rhyming verse, from A to Z, and accompanied by amusing photographic illustrations of custom designed LEGO® models and mini-figures. This uniquely illustrated edition is sure to delight LEGO® enthusiasts, as well as fans of the Great Detective, children and adults alike. This collected volume reprints all twelve short stories comprising The Adventures of Sherlock Holmes – Re-Imagined book series in one paperback edition. 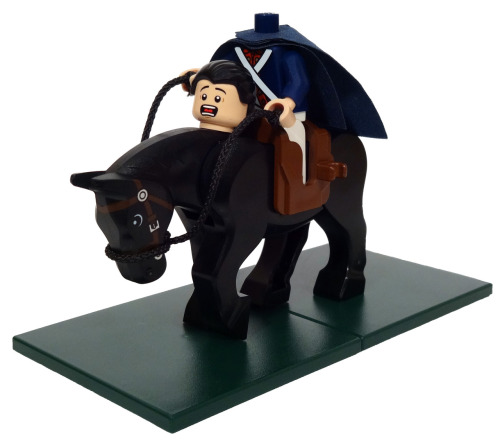 Between its covers the original tales by Conan Doyle have been amusingly illustrated using only LEGO® brand minifigures and bricks. The illustrations recreate, through custom designed Lego models, the composition of the black and white drawings by Sidney Paget that accompanied the original publication of these adventures appearing in The Strand Magazine from July 1891 to June 1892. Paget’s iconic illustrations are largely responsible for the popular image of Sherlock Holmes, including his deerstalker cap and Inverness cape, details never mentioned in the writings of Conan Doyle. The Adventures of Sherlock Holmes – Re-Imagined — The Complete Collection is available from all good bookstores including Amazon USA, Amazon UK, Waterstones UK and for free shipping worldwide Book Depository.